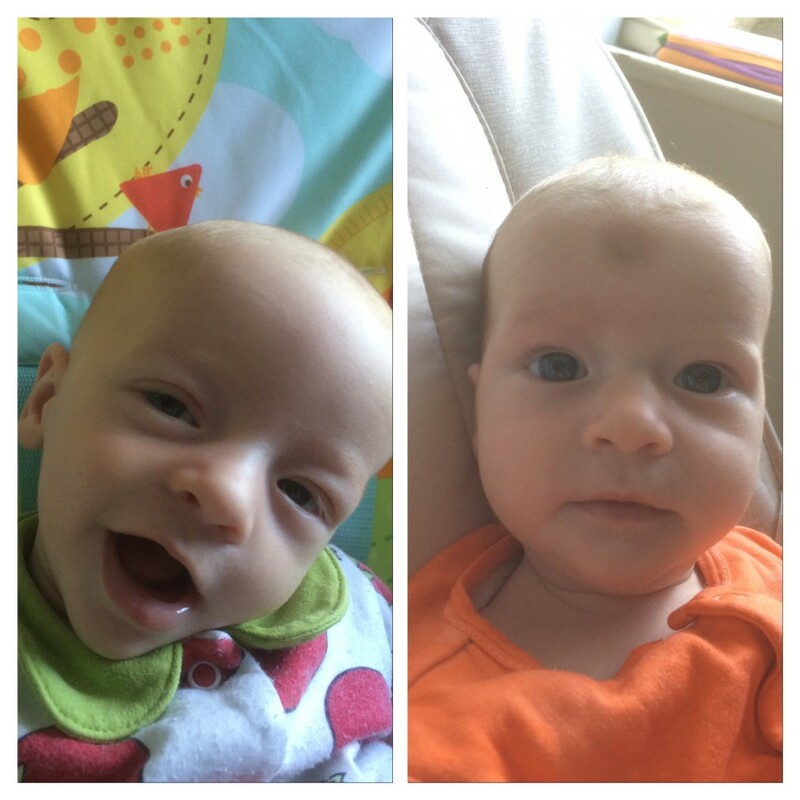 Since the twins turned 3 months last week, we’re just emerging from the fourth trimester. We survived it! And, if I may say so, the babies are not just surviving, they’re thriving. The linguist in me finds the term fourth trimester slightly awkward (how can a period of time with TRImesters have four parts? ); however, I do like the idea behind the term. It refers to the fact that human infants are still so heavily dependent on their primary care giver(s) in the first few months after birth. This means the babies like to be constantly close to me (or Tom, though he doesn’t have food for them 😉 ) and won’t settle easily very far from me. This is normal, a survival instinct. Here’s my list of the essential things that have helped us all through this trimester…. I would say this has been the most essential one. 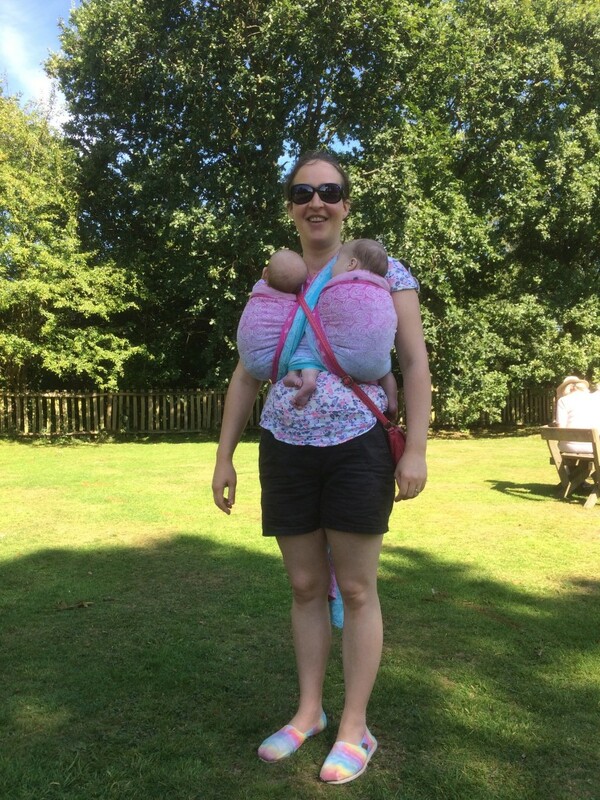 We don’t have a pram/buggy, so the twins have come everywhere literally wrapped on to me. With two older boys to run around after, we do a lot of walking. 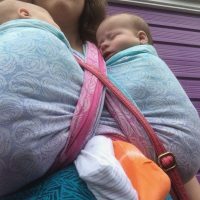 And actually the twins nap best when walked outside in the sling, so it’s not just with the boys that we venture out. 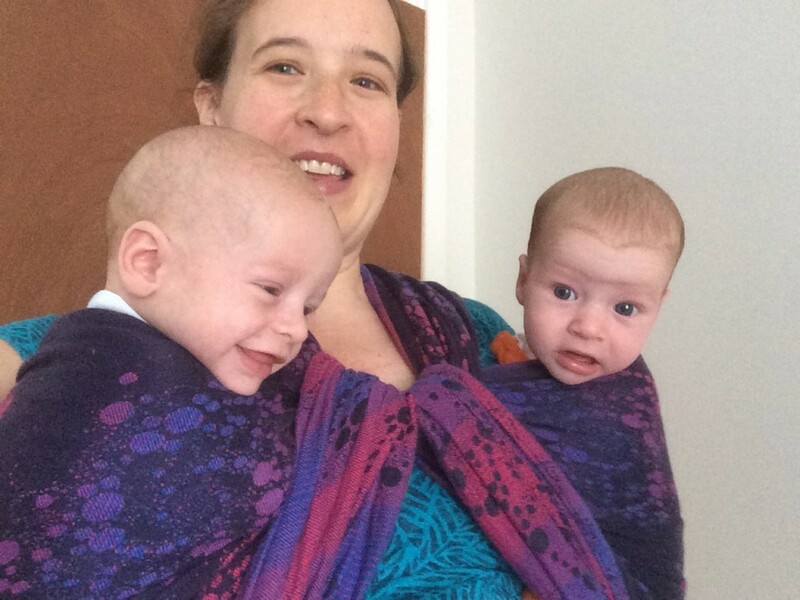 I have three woven wraps – a size 6, a size 7 and a ring sling. 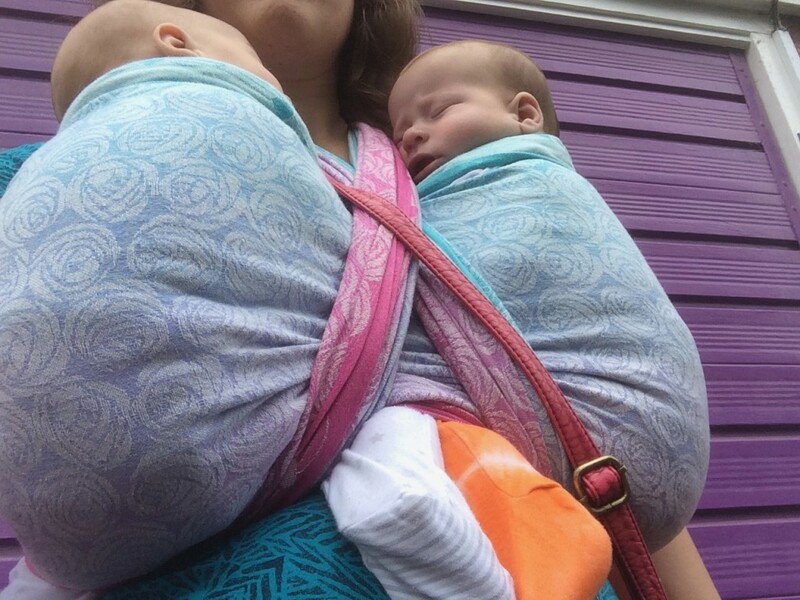 The 6 and 7 I’ve used for tandem carries, and the 6 and ring sling for single carries when one needed holding closer than the other around the house or if I’ve had another adult to carry the other. Babies love being held close and warm to us in this position and moving because it reminds them of the womb, so helps them transition to life outside the womb. It’s no wonder they sleep best here. I’m so pleased that I bought a twin feeding cushion, because it’s such a big help when I’m on my own with the babies. There are a few different brands, but the one that suits my body shape best is the Peanut and Piglet. They don’t always want to feed exactly at the same time, but it’s still good to be able to have them both there next to me, and they both nap well there after a feed. This just means I’m stuck on the sofa for longer – not always practical, but sometimes I do just that, and it’s what I’m doing right now as I type. If there’s another pair of hands around, I do more single feeding as the other baby can be held/jigged as I feed one. We made it to 3 months of exclusive feeding at the breast! Our homemade supplemental nursing systems have been brilliant, and the babies have fed well, meaning they haven’t needed to have any bottles. I estimate that they get roughly 50/50 breast milk and formula each on average. 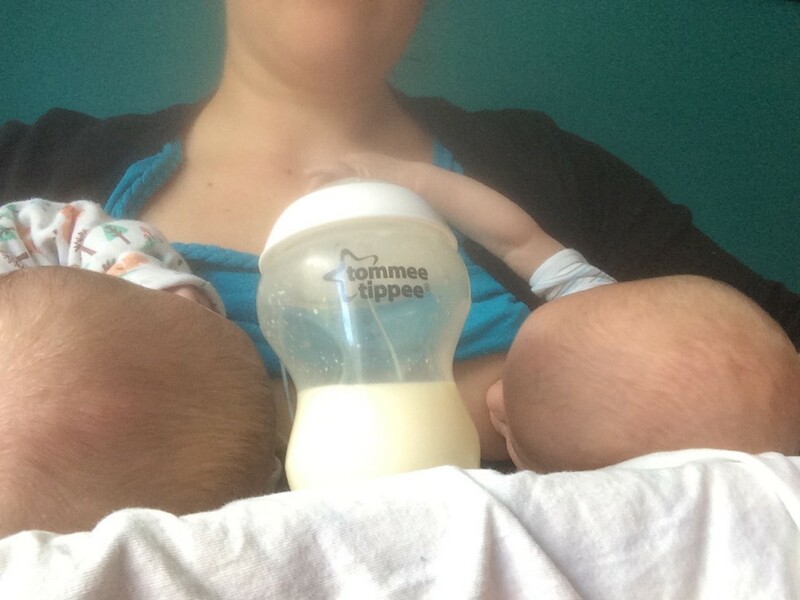 I actually think it would be harder to bottle feed twins on my own, at least in a properly paced manner, because it would be hard to hold two babies and be responsive with two bottles at the same time. Instead I can set up the SNS, stand it on the cushion, and let them feed as an exclusively breastfed pair of twins would. We would absolutely not have survived as well as we have done without a lot of help from my parents and Tom’s parents. 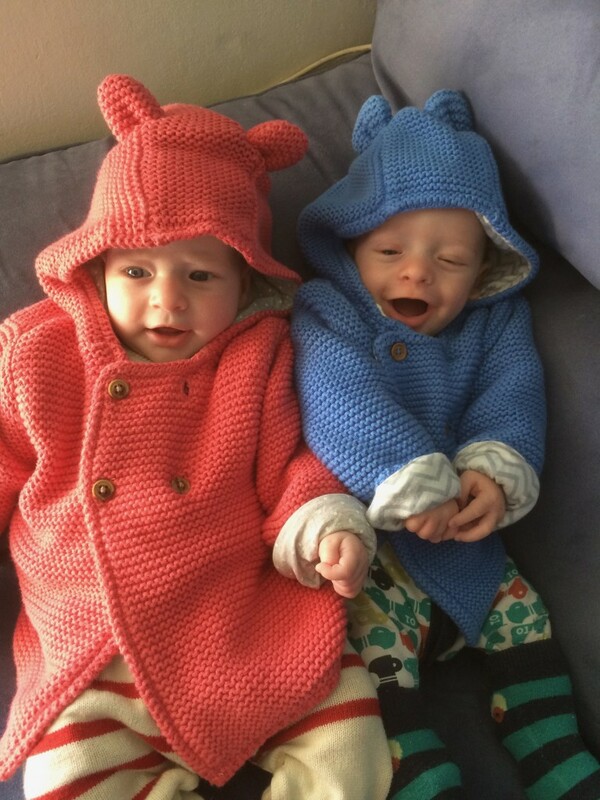 I give a huge hats off to parents of twins who do it without family or paid support. We are blessed with this extended family village that many families have lost these days, and it helps that 3 of the 4 of them have recently retired meaning they have more free time to spend with us. They have helped in practical ways such as looking after the older boys, cooking, cleaning, laundry, and even planning a garage conversion so we have room for the twins to sleep when they move out of our room! This has meant that I have been able to give the twins so much of my attention, instead of having to split it between all these things. It helps too that Tom has such a short commute and a flexible job, so he too has taken on a lot of jobs around the house that I would usually do, which he’d done when I was so sick in pregnancy anyway. 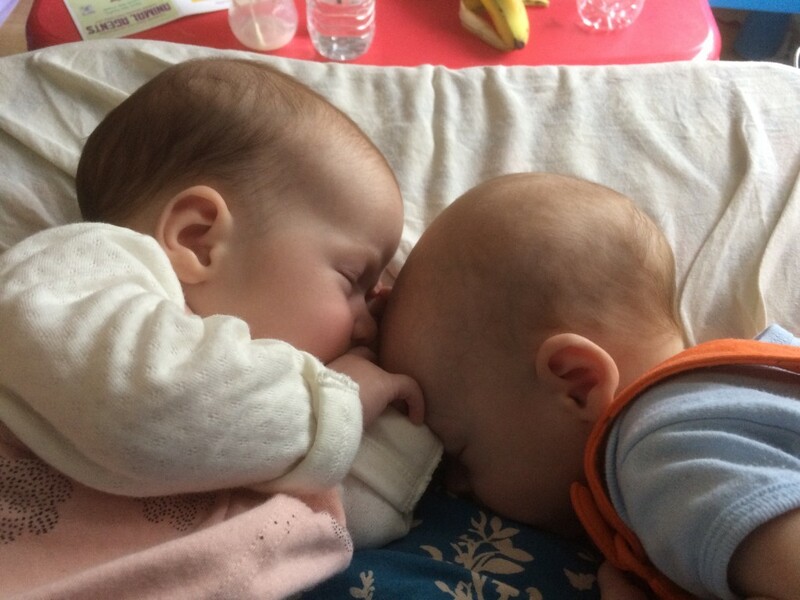 I think my expectations for life with newborn twins were pretty low – I knew it would be chaotic and I knew we wouldn’t be able to attempt to just carry on as normal. So this helped me, even before they arrived, to embrace the chaos and not worry about it. We get by on the minimum of housework, and just work on getting everyone fed, toileted, and to the right place at the right time each day. We have managed the odd day trip out together as a family, but only with extra help from extended family (see the above section!) and I certainly wouldn’t attempt that more than once every couple of weeks or so because even then it’s pretty full on. I know it won’t be forever, and lots of time around the house and just doing plenty of local walks has really helped me feel like I’m enjoying the babies and this time with them so young. I’m typing on this right now, in the notes section, and will squeeze in a few minutes on the laptop at some point to publish the blog post. I use it to watch TV in the middle of the night to keep me awake whilst tandem feeding. I use it to do bits of online shopping. I use it to chat with other people via social media, particularly other mums with twins who know exactly what life is like at the moment, at any hour of the day or night (there’s always someone up!) – it’s a virtual “village” of solidarity. I use it to keep up to date with the news and to check the weather (do I need to take my umbrella with us everywhere today?) I use it to keep an eye on how my business is ticking over whilst I’m on maternity leave. One of my favourite features is the camera, so I can quickly snap all sorts of moments I want to remember as they occur, and the pictures automatically appear on our cloud back up so I can do something with them at a later date. All these uses are found in one handy device that fits in my pocket. I didn’t have one when the boys were babies, and used to wonder if it was worth it. My conclusion now is that it definitely is. So I’m very grateful that we are blessed with the means to be able to afford one. All these things have helped us so much over the past three months, and I’m sure they will continue to do so as we head on out into the next three and beyond…. Activity play – wot so funee? Gone are the days that I have time to blog loads of funees from every week. But as we’ve had an early morning, I thought I’d blog one from each boy that we’ve had a giggle at this week…..
Andrew is looking forward to Christmas already. The build up has started at nursery, and he’s getting very involved in the festivities. Every day that he goes, he comes home and tells us all about which songs he’s been learning, and even gives us a quick rendition at the dinner table. These songs are all for the play that they’ll be putting on the week before Christmas. It’s one of the traditional plays for the time of year, where the children act out the happenings of the first Christmas – Mary, Joseph, baby Jesus, animals, stable, shepherds, angels – you know what I mean. In Andrew’s mind they are practising the “activity play”. No matter how many times I say that it’s actually a nativity play, he insists on calling it the activity play. So this is what it shall henceforth be called in our house! Joel’s best funee from this week also involves singing. Both boys are very into singing, and their musical Daddy says they are very good at it (I know, he’s biased). Joel still doesn’t say much, but he makes himself understood, and one day this week he made himself quite clear through the medium of song. He was getting under my feet in the kitchen while I was trying to make some lunch for us all, so Daddy decided to take him upstairs to the living room and let him watch a DVD for 5 minutes (that’s about as long as he’ll watch anything for). On the way up, Daddy asked him what he’d like to watch, not really expecting a reply, but it was something to say when Joel wasn’t too happy about being removed from the kitchen. However, Joel immediately started singing (in la-la-las) the Fireman Sam theme tune. Daddy put that on, asked him if that was what he wanted, and Joel let out a big resounding YES! Who says I need to talk?! Author RuthPosted on 11/11/2014 11/11/2014 Categories linguistics, mum-hoodTags #funee, DVD, nativity play, words, wot so funeeLeave a comment on Activity play – wot so funee? To snook or not to snook – wot so funee? I went through the notes in my phone the other day and found some funees that I haven’t written up. So these are from the past couple of months, but I can still remember them now that the notes jog my memory. When we were still living at Granny and Grandad’s house, Andrew saw a bit of a game of polo on the TV when they had it on in the background. He looked at it and came out with quite an accurate name for it: “That’s horse golf!” So now I will always think of polo as horse golf, because, well, it is really! I have to say that both boys do like what some might think of as ‘healthy’ breakfast cereals – give them a bowl of weetabix or shreddies any day over a sugary sweet cereal. Andrew has got particularly into bran flakes recently, since we moved into our new house and Daddy ordered a couple of big boxes on our internet supermarket shop for when we first arrived. Only he likes to call them “brown flakes”, because that’s what he though he heard us say the first time he asked what they were. And indeed they are brown, and they are flakes, so again another accurate description from our little observant one! Andrew has recently noticed that ‘Andrex’ is only one letter different from his name. The reason why we have talked about Andrex is that he is quite prone to doing an Andrex with the toilet roll when he’s taking some off the roll after going to the toilet. Joel has also been known to Andrex the roll, just for fun – what toddler hasn’t tried that?! So Daddy decided to show him a youtube clip of the old 1990s Andrex advert – the one where the boy is sitting on the loo and the lab runs off with the end of the roll, which he thinks is funny until there is none left for him to use. Andrew thought it was very funny watching the dog run off with the toilet paper, but his question at the end was: “What’s the boy doing on the toilet?” Erm, what do you think Andrew?! Give the lad some privacy. No wait, this was aired to millions of people when it was on TV, and now even more people via youtube. Over the summer we went to a couple of the ‘drop-ins’ that our church had organised to help entertain families in the long summer holidays when there are no groups on. As well as toddler toys, there were also some bigger kids toys like table tennis tables, football tables and a snooker table. Andrew was far more interest din these various tables than he was in the usual cars and blocks that he annoys playing with at toddler groups. At one point he was trying to get me to come over to him at the snooker table, but I was busy trying to entertain Joel in another way (he’d already nearly caused a lot of damage by throwing a snooker ball across the room – oops!) Andrew’s words to try and get me over there were: “Mummy, please come over, we need to snook!” Of course, what does one do at a snooker table? One snooks, it’s obvious. One night around bedtime I was trying to let Joel have some milk time, but Andrew had joined us and was jumping on the bed, so totally distracting Joel. I could hear Daddy coming up the stairs, so when he got to the top, I shouted over to him: “Can you remove Andrew from our presence please Daddy?” Andrew’s response was priceless: “Where? What presents? !” with a disturbed look on his face! But Andrew isn’t the only one who causes trouble when we’re trying to do something else. One day when I was trying to make lunch for us, Joel managed to grab some biscuits off the work surface and was starting to munch them without me noticing. Andrew was on the ball though and shouted loudly: “Joel’s causing hammock! !” I had to think twice about what he meant, but when I saw the start of what could have been far more mess had we not stopped it, I understood why it was “hammock” (or havoc). Author RuthPosted on 26/09/2014 25/09/2014 Categories linguistics, mum-hoodTags #funee, language, preschooler, wot so funee2 Comments on To snook or not to snook – wot so funee? Doughnuts at nursery – wot so funee? I realised recently that i haven’t written a wot so funee? post for a few weeks. Life got busy with the move and the business getting busier by the week. Althoughh blogging may be on the back burner, I still want to keep a record of our lives on it, and that includes the funny things that the boys say, because language is something that really interests me and I want to look back on their language development one day and smile 🙂 So here are just few of the funees that I’ve collected over recent weeks…. When I was cutting Andrew’s finger nails one day, he insisted that I hadn’t finished when I thought I had. We counted the 10 fingers and I showed him that I’d cut the nail on all of them. “No, Mummy…. and my foot nails!” How wrong I was! It’s logical to call them foot nails, but it made me giggle. One day (OK, it’s most days) Joel was annoying Andrew when they were playing in their bedroom/play room. “Go outside at mediately!” said Andrew. No that’s not autocorrect on my post, that’s ‘at mediately’ for ‘immediately’. He said this several times, with a crescendo at each repetition of the command. Joel didn’t take any notice of him, so in the end Andrew shrugged his shoulders and quietly said “OK, I’ll go outside then” as he walked off into the garden. If you can’t get rid of little brother, remove yourself from the room instead – it makes sense. Me: So, Andrew, did you have a nice snack at preschool today? Andrew: YES! We had doughnuts! A: Yes they were round with a hole in. M: Ah, so ring doughnuts? So they didn’t have anything in them, like jam. A: No we had a spread on top of them. M: Right…. what flavour was the spread? A: It was cheesy, very yummy. M: Aha…. were they not bagels Andrew, with cream cheese on? A: Ah yes, they were bagels, but they looked like doughnuts cut up. So it turns out I won’t be needing to mention the nutritional content of snacks to his key worker after all. Phew! I hope to write up more funees that I have saved in the notes on my phone soon! Author RuthPosted on 09/09/2014 09/09/2014 Categories linguistics, mum-hoodTags food, language, preschooler2 Comments on Doughnuts at nursery – wot so funee? ‘Counting’ – wot so funee? Most of my wot so funee? posts so far have been about Andrew’s toddlerisms. But Joel has just started to produce some hilarious funees in his speech. He doesn’t say a lot, but what he does say is great! Recently he’s become very keen to ‘count’ before doing something – for example the ‘1-2-3-wheeeee’ game that we play when two adults are each holding one of his hands and on the count of 3 we pick him up and swing him to ‘wheeeee’. The thing is, he doesn’t actually say ‘1 2 3’, but rather something more like ‘wee-baa-wee-baa-wheeeeeeeee! !’ but you can tell that it’s his way of counting by the intonation and that he does it and then stops it before doing some action. I managed to capture it today when he was throwing some balls in the garden – counting before he let go of each ball. Plus some tennis balls into the pot fun following the counting…. 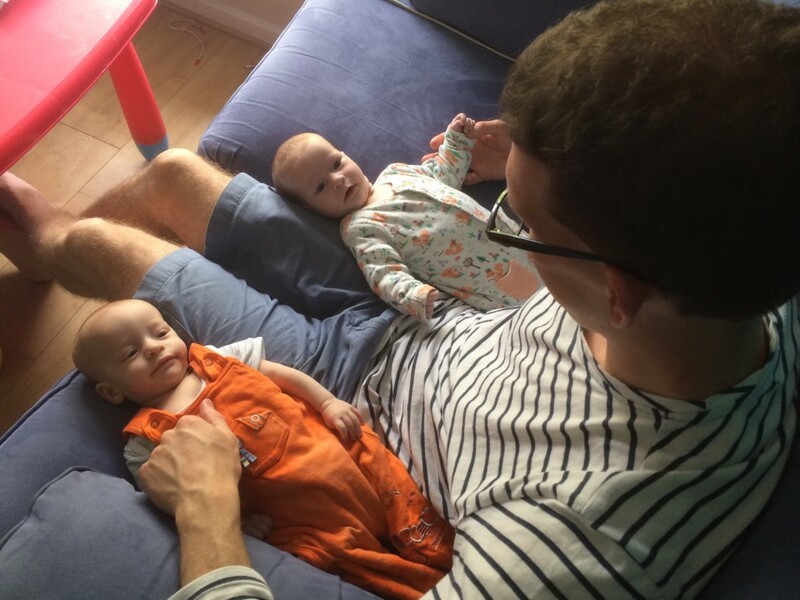 Author RuthPosted on 19/08/2014 19/08/2014 Categories linguistics, mum-hoodTags language, language acquisition, speaking, speech, speech development, toddlerLeave a comment on ‘Counting’ – wot so funee? Fighting arrows – wot so funee? A while ago in a wot so funee? post I shared how Andrew kept going on about “fighting arrows at Grandma and Pop’s house”. I had no idea what he was talking about, until one day we were in the 99p shop with Granny, who had said that each boy could have £1 to choose a toy to buy. Andrew’s eye was obviously drawn to a toy darts set (the kind with velcro on the end of the darts that sticks to the fuzzy dart board). He suddenly shouted: “Look it’s fighting arrows!”, so Granny and I asked him what it was that he was calling fighting arrows and he picked up this darts set. Mystery solved! Apparently Grandma and Pop’s shed had one of these in, among all the toys that once belonged to Daddy and his siblings. Who knew? Andrew did, with his amazing memory for these things! And the next day we got another fighting arrows related funee…. When he was talking to Granny and Grandad about his fighting arrows, he decided that he’d bought the set in the “99 pounds shop”. It was worth 99p for the entertainment it’s provided, but probably not £99. I think that’s as far as I can string out the fighting arrows funees for this week. About this time last year, I blogged about our short break in Germany for my birthday. One of the funees that happened whilst we were there was when Andrew thought that my friend’s house there was ‘Germany’. He couldn’t get the concept of a country and that the whole place was Germany, not just that one house, because that was, after all, where we were visiting. He’s done a similar thing recently with a swimming pool that we’ve been going to. We’ve spoken about going to Leamington to swim as that’s where we’ve been going on Thursdays if Granny is off work – Newbold Comyn swimming pool. Recently I picked up a leaflet for summer activities in Warwickshire, and he was looking through it and saw a picture of Newbold Comyn pool. He immediately recognised it and exclaimed: “That’s Leamington!” Clearly to him the pool is Leamington. Here are a couple of foodie funees from recently. We’d bought two of those tubs of mini cakes (brownies/gingerbread men/cornflake cakes etc.) that are always on some 2 for £X offer in most supermarkets. When it came to pudding time after tea I said that the boys could have one or two of these mini bites once they’d finished their fruit. Andrew asked if he could have some “fat jacks”. I guess flapjacks could make you fat if you eat too many of them. Another night for pudding, Granny said that there was some custard left over from when we’d had apple crumble at the weekend, so we could chop some banana into it for the boys to make banana custard (my idea of dessert hell!) That was met with great pleasure, so Granny went in to the kitchen to bring it out. When she was gone Andrew said how much he was looking forward to his “banana mustard”. Even worse than my idea of dessert hell! English can be confusing with all its homonyms. As Andrew discovered again when he was watching some Commonwealth Games swimming with Granny one evening this week. There was a Welsh swimmer in the pool, and Granny said she was cheering her on because she was the only Brit in the pool at the time. She said to Andrew that he could cheer ‘Come on Wales!’ if he wanted to. After looking slightly confused he carried on watching and a little later came out with: “I might see a whale in there in a minute!” Water, whales, Wales: all a bit confusing for a 3 year old! Andrew is very good at coming up with names for things based on what they do or look like. One recently that made me laugh was his name for the gardeners who come and mow Granny and Grandad’s lawn every coupe of weeks. He looked out just after they had finished and squealed with delight: “Look! The lawn mowers have been, and now they’re finished so I can go outside again!” He was definitely referring to the people (a Dad and daughter team) because they only actually have one mower between them. Author RuthPosted on 05/08/2014 05/08/2014 Categories linguistics, mum-hoodTags #funee, language, preschooler, wot so funee4 Comments on Fighting arrows – wot so funee? Nooooooo! – wot so funee? I have loads of funees from Andrew noted down in my phone but I haven’t had chance to write them up into a post. But Joel has been hilarious this week with his new found way of saying no! He still doesn’t say many words, he’s far too interested in climbing, running, generally getting into mischief than talking about it. Andrew was similar at this age, and then suddenly started chattering a few months later, so I’m not concerned about his lack of linguistic output at the moment. I managed to capture some of his hilarity on video the other night at the dinner table. I don’t need to say anything about it – just watch it for yourselves. Joel’s face looks as if he’s saying “wot so funee?” when we’re in fits of laughter and clearly that’s encouraging him to keep doing it! Author RuthPosted on 27/07/2014 25/07/2014 Categories linguistics, mum-hoodLeave a comment on Nooooooo! – wot so funee? Where’s Fred? – wot so funee? Granny and Grandad took the boys to the restaurant with the big yellow ‘M’ for the first time in their lives a few weeks ago. We were over at the new house, and part of their treat whilst being looked after by the grandparents was to experience a cooked breakfast there. That in itself isn’t particularly funny, but ever since, when we’ve been out and about in the car and driver past a restaurant that has a big yellow ‘M’ outside, this is Andrew’s reaction: “Look Mummy, there’s another Old MacDonalds!” All together now… E-I-E-I-Ooooh! We go past about 4 on our way from Coventry to Bournville, and don’t I know it now! As he’s a young Brit, it’s essential that Andrew learns to take an interest in the weather. He’s become very interested in looking at the app on my phone with me in the morning, when I check the likely meteorological state for the day. Generally there has been a lot of sun and just white clouds on it recently when we have checked. One day we were flicking through it and Andrew was commenting at what the weather was going to be like based on the symbols that he saw: “That day’s sunny, that day’s cloudy, and that day’s….erm….moony!” That ‘day’ would be a ‘night’ Andrew, hence the moon symbol! There was one rain shower the other day though when we were over at Bournvillle Park having dropped off some more supplies to the decorator at the new house. We’d had a good play at the park already, so I suggested that we go and pay Daddy a visit at work up the road because his colleagues haven’t met us yet and they kept saying they would like to (goodness knows why they wanted 2 boys rampaging around the office!) This was Andrew’s response to my suggestion: “Ah yes, that’s a good idea, because there’s a roof on Daddy’s work so we can’t get wet there!” Very true, the University of Birmingham is a fab employer, they even provide a roof to work under – luxury! Andrew is very good at making a drama out of the smallest bump or knock to his body, especially if Joel was anywhere near him when it occurred. The other day he slipped slightly in the bath and bumped himself a little, nothing major but he was tired and acted like it was the end of the world. Daddy got him out and had a nice wet cuddle, then asked if he wanted to go back in with Joel. He replied in a voice that was still sobbing: “NO! Not until I’ve calmed down!” Which is exactly what we say when he’s crying because wants to do something and we think it would be better to wait until he’s stopped crying before we carry on with it. And finally for this episode of wot so funee?, an interesting insight into Andrew’s idea of which words can be nouns as well as verbs. The boys often run around with no nappy or pants on when we’re outside in the garden of an afternoon. We have had a couple of incidents where I’ve had to poop-a-scoop just like a dog for Joel, though Andrew is well and truly potty trained now. One day I suddenly heard Andrew shouting “Ooooh, I can stink POO!” Apart from my reaction to immediately find out where it was and isolate them from it, I had to marvel at this interesting use of ‘stink’ as a transitive verb. We can say ‘a stink’ (noun) and ‘you stink’ (intransitive verb) but not ‘I can stink you’ (transitive verb). However, we can say ‘a smell’ (noun) and ‘you smell’ (intransitive verb) AND ‘I can smell you’ (transitive verb). So no wonder it’s confusing for him – stink is just a stronger word for smell, right? So why not use it as a transitive verb too?! Author RuthPosted on 17/07/2014 17/07/2014 Categories linguistics, mum-hood2 Comments on Where’s Fred? – wot so funee? Book bed – wot so funee? I’m sure there must have been more funees this week, but with everything going on with the new house and my business seems to be booming, I’m surprised I’ve had enough time to jot down any of them at all! For some reason, Andrew has been going on about playing with “fighting arrows” at Grandma and Pop’s house. I have no idea where this has come from. From what I’ve managed to get out of him, the “fighting arrows” are basically Robin Hood style arrows, as in bow and arrow arrows, probably because Granny bought the Disney’s Robin Hood DVD and he’s watched it a couple of times. I don’t think we played with them at Grandma and Pop’s house last time we went (which would have been Christmas, it’s a long way away), but maybe he remembers something that my adult brain doesn’t? Every 2 weeks, there are a pair of gardeners that come and do the garden at Granny and Grandad’s house – they mow the lawn and generally tidy it up. Normally they come around lunchtime, but last week they came a bit later and the 2 of us were sitting resting in front of a DVD whilst Joel was napping. Andrew saw their van out on the drive as he went to fetch a toy from the dining room at the front. He came back in and said excitedly: “The gardeners are in the car park of the house!” I guess that’s what it is really – there are 3 cars there at the moment, which is quite a lot for one house. Another day, we were playing out in the garden after Joel’s nap, as we do most days at the moment. There is a small wooden hut beneath the branches of the magnolia tree which used to be used by our dog as a kennel when she was alive, but now it’s used as a toy storage hut. Andrew was standing inside it, at the door, peering out across the lawn at Joel and me. He was grinning, and suddenly shouted out: “It’s alright Joel, you can come in, there’s no fire alarm!” I thought we hadn’t had many fire alarm references recently – about a year ago all the wot so funee? posts I wrote contained a fire alarm reference! A: When we live in our new house, I want a book bed! Me: What’s a book bed? A: It’s a sort of double bed with ladders, I go on top and Joel goes on the bottom. Me: Ah brilliant, a BUNK bed I think you mean! A: Yes that’s right, a bunk bed please [cheeky grin]. I don’t think it’d be wise to have a bunk bed just yet, but if they still want one once Joel is in a bed and not his cot, then we can think about it. Daddy says there are pros and cons to sharing a bunk bed with your brother. Author RuthPosted on 02/07/2014 02/07/2014 Categories linguistics, mum-hoodTags #funee, bed, garden, language, preschooler, speaking, speech, talking, wot so funee1 Comment on Book bed – wot so funee? Rocket shower – wot so funee? Even though Andrew is old enough to go to preschool (he qualified for the 15 hours funding at Easter, the term after his 3rd birthday in January), he won’t start at one until September because we are still in the middle of moving and won’t be in our permanent home until the summer. I must write a post on our choice of preschool soon, I keep meaning to. But I digress. So I tend to call him a toddler still, even though I know he’s really a ‘preschooler’. Andrew himself is also keen to point this out, and insists that he’s a “toggler”. ‘D’ sounds in the middle of words aren’t his strong point, though he can do it if he tries. He’s keen to learn, and is doing well with numbers and letters. If he’s in the right mood, he’ll ask me to speak in French or German with him (if he’s not in the mood, he covers his ears if I try to speak them with him! ), so I take the opportunities when he asks, which have been quite frequent recently. The other day we were listening to a German CD of songs in the car as we often do, and suddenly he came out with: “When I’m older and I can speak German, I’m going to teach Daddy how to speak German too!” I told Daddy this, and he was happy with that being as he’s forgotten most of the GCSE German that he did. For a couple of weeks now Andrew has been saying the word “chameleon” at weird times, seemingly randomly inserting it into sentences when it doesn’t make sense. I’ve tried to ask him what he means and prise out of him what ‘chameleon’ means to him. But I was unsuccessful. Then Granny experienced the same thing with him one day, and figured it out: they were looking at a book and there was a tall thing, a little thing, and something in the middle – it was “chameleon”, or ‘medium’. Aha! We’ve also been talking about hot and cold recently – the sun is hot, the weather is warm, and the water in the paddling pool is cold when it first goes in or it’s “just the right pretenture” when it’s been sitting in the sun a while and has warmed up to luke warm. A game that the boys have recently got into is pretending that the shower cubicle in the bathroom is a rocket. I can kind of see the similarity – it’s tall and cylindrical. Andrew closes the doors, narrating what he’s doing, and counts down to blast off. Then they go to wherever it is that they’re heading and enjoy their space flight. (I say ‘they’, I don’t think Joel really quite understands what he’s doing, but he thinks it’s funny nonetheless.) The other day I asked him where they were going in their rocket. His answer was this: “I’m going to ‘costamel’ and Joel is going to church, it’s 9 miles away”. I thought I hadn’t heard the ‘costamel’ bit right, so asked him again where just he was going, and he said it again. So I asked what this ‘costamel’ was, and his reply was (rather predictably) “it’s costamel Mummy”, said in a ‘why, don’t you know where that is Mummy? !’ I asked if he meant hospital? No, not hospital. Costa?! Nope not Costa either. This will remain a mystery until someone has a ‘chameleon’ Eureka moment with it at a later date. Author RuthPosted on 27/06/2014 27/06/2014 Categories linguistics, mum-hoodTags #funee, language, preschooler, rocket, speaking, speech, talking, wot so funee1 Comment on Rocket shower – wot so funee?